Best of all, it’s useful. Not only will four adults fit in the Crosstrek, but you can haul a load of junk, er stuff, in back with its 22.3 cubic foot cargo bay. Fold flat the split rear seats and it’ll haul 51.9 cubic feet of your best stuff, just like a wagon. And it has AWD, like an SUV. Yet, you won’t feel like you’re getting to your destination very fast, due to the underpowered 2.0-liter 4-cylinder boxer engine that Subaru has used for years. It makes 148 hp, but in a 3,164-pound car, that seems on the soft side, especially when hooked up with Subaru’s Lineartronic CVT. That’s a continuously variable transmission and its aim is to save gas, which according to the EPA it does. This is rated a healthy 25 mpg city and 33 mpg highway. You won’t find many crossovers and fewer SUVs that get such ratings, unless they are hybrids. But the transmission simply revs this tightly wound four-banger up and holds its revs at 3,000-3,500 rpm to create quite a racket until the car gets up to speed. This is especially noticeable if you tromp the gas pedal to hit the bottom of a highway entry ramp at 55 mph. Naturally, the more you tromp that pedal, the less mpg you get. I managed just 20.3 mpg while the trip computer was insisting on 21.9, still not great in about 60% city driving. Ride also is on the choppy side as the car’s suspension seems too tight over our sharp city street bumps and frost heaves. Crosstrek rides on a 103.7-inch wheelbase and my experience is that you need 105 to 109 inches to spread the bumps more smoothly. There is the all-wheel-drive system that Subaru is famous for, and that’s a bonus in sloppy weather. We had a solid snow storm while I had the car and it was sure-footed to be certain. Also standard are traction and stability control. 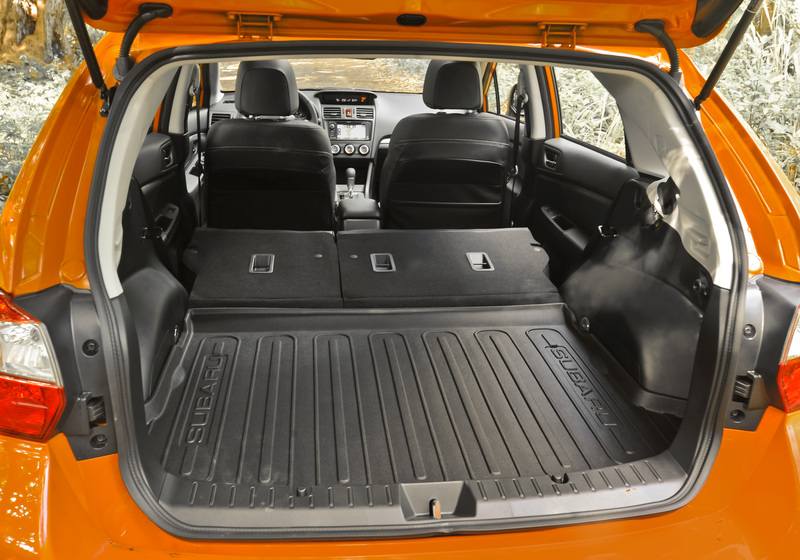 Folding down the seats creates a large, useable cargo area. Now this isn’t a fancy luxury crossover, so you may be able to overlook a few of my concerns. 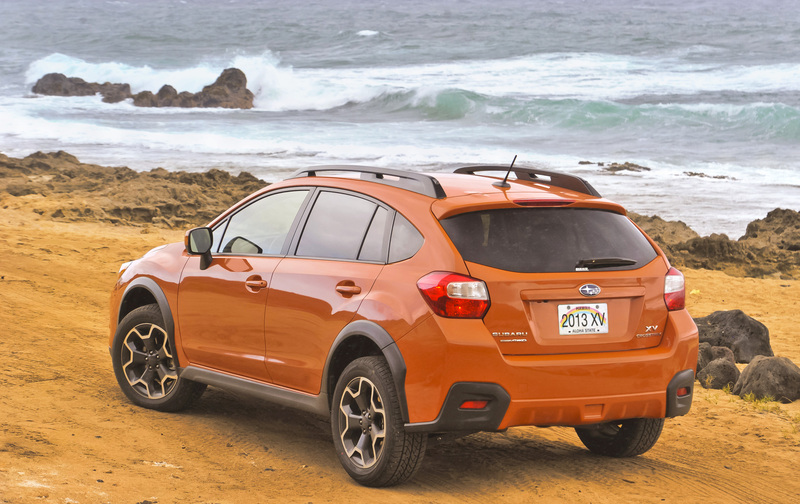 The base XV (that stands for Crossover Vehicle) Crosstrek Premium (clever how even the base models have high-end names now), starts at $21,995. Add a $795 delivery charge to that, or the Limited, which I test drove and which starts at $24,495.The Premium model has the same engine, but instead of the CVT, uses an older 5-speed manual that only provides an EPA rating of 23 mpg city and 30 mpg highway. A 6-speed would seem more appropriate in today’s market. The tested silver Limited added a $2,000 navigation package that also includes a moon roof. The navigation system is displayed on a small touch screen in the middle of the center instrument stack. The screen also controls the radio and all the buttons are almost impossibly small to use while driving. 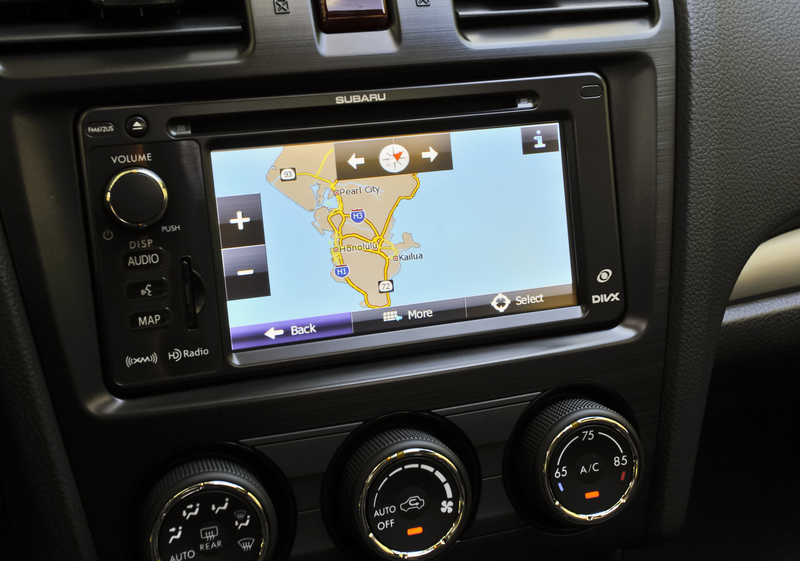 Selecting a radio channel requires hitting a wide, but narrow area on the screen and invariably you hit the wrong channel; best to operate this while the car is stationary. The navigation/radio screen has small, hard to use buttons. All told the test crossover came to $27,290, still well below most crossovers and small sport-utes. 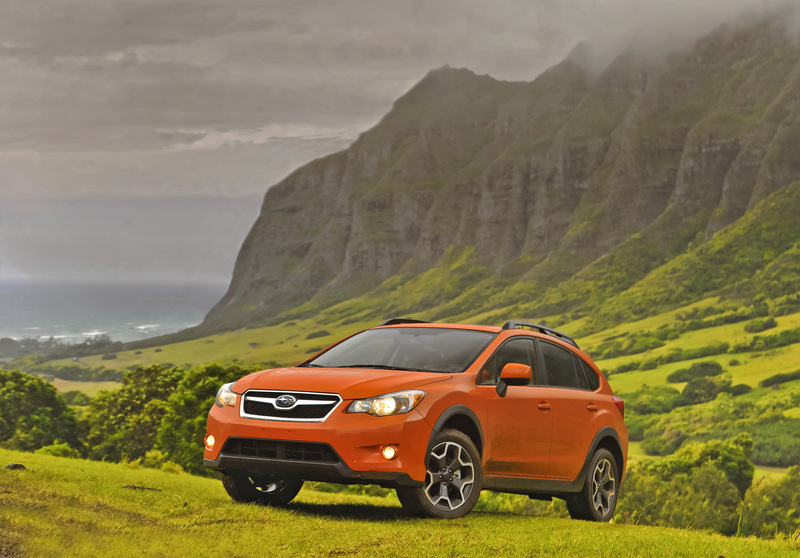 So value remains a Crosstrek advantage.The conservative interior reflects that. This one was all black with leather seats and a textured dash and doors. The seats had white stitching and the roof liner was gray to lighten the interior up a bit. Seats are fairly flat, with mild contouring on the seat backs. Front seats are manually adjusted with a pump lever on the side to raise and lower the driver’s seat. When the engine calms down, the interior is relatively quiet too, with little tire and wind noise. Controls and gauges are easy to see, but plain. Under the radio/nav screen are three large climate control knobs. Those are easy to see and use, but you’ll need to leave the fan at fairly high speeds to warm your feet and I always had the temperature set at 78-80 degrees. There are automatic lights, key start, push-button entry, power mirrors and windows and a manual tilt/telescoping steering wheel with radio, phone and cruise controls on the hub. Best of all is the rear backup camera, plus the Limited comes with two-speed seat heaters. Those seat buttons are poorly located well behind your elbow in the center console almost hidden under the front edge of the center storage container. Under the hatch is a thick rubber cargo tray, which I found useful, and the crossover comes with a retractable cargo cover. Overhead is the moon roof with sliding cover to block the sun or cool winter air seepage, but sadly the sun visors don’t slide or offer extenders. Up on the roof are cargo rails too, so if you’re an outdoorsy type you could strap a kayak or bike to the roof easily. The hatch also features a wiper. I really like the Crosstrek’s looks, augmented by sporty distinctive five-spoke wheels, but its lack of power and tiny radio/navigation system are drawbacks. But, if you need low-cost hauling with AWD, this could be a viable option. An Outback would be my choice, but it costs considerably more. Hits: Good looking, handles well, has AWD and good ground clearance. Interior includes excellent cargo space under the hatch, plus seat heaters. Misses: Noisy engine that’s underpowered, somewhat bouncy ride and disappointing gas mileage. Inside has tiny radio screen with tinier touch screen buttons that are hard to use while driving. Visors don’t slide.